Why did I start AbidanShah.com? Often I am asked about my perspective on faith, values, and politics. Having spent 17 years in India and the past 20+ years in the United States, I have been able to view these subjects from both eastern and western lenses. Moreover, my ongoing PhD study on the impact of postmodernism on biblical studies has enabled me to understand the changing philosophical landscape of our culture. As a pastor and concerned citizen, I feel compelled to give answers that are clear and biblical. About Abidan Paul Shah – Abidan came to the United States in 1991. After completing his Bachelors in Broadcast Journalism, he answered God’s call to enter full-time ministry. He graduated with a Masters of Divinity with languages and was called to be the pastor of Clearview Church in Henderson, NC. In the past 19 years God has greatly blessed the church through his leadership and vision. In the past couple of years the church has purchased new facilities and further expanded it to accommodate the rapidly growing ministry at Clearview. 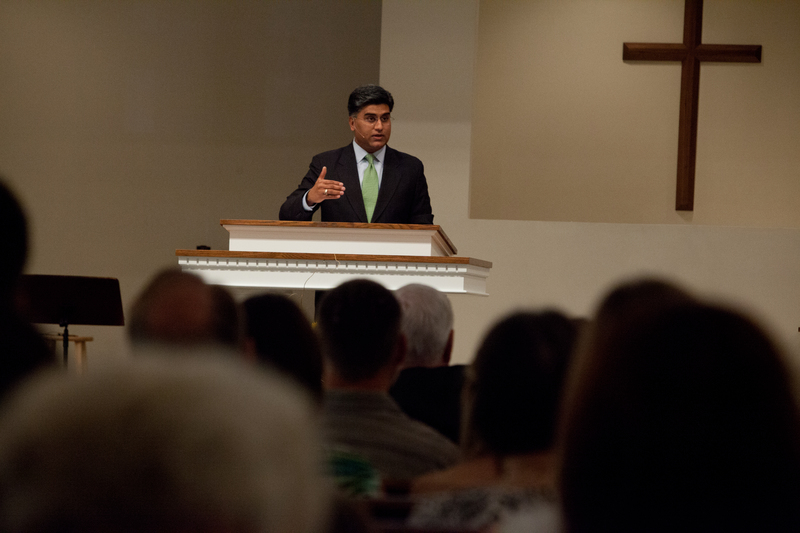 Pastor Shah preaches expository messages that are simple to understand and apply. Every sermon is a challenge to grow in our personal relationship with Jesus Christ. Abidan is currently completing his PhD in New Testament Textual Criticism (ancient biblical manuscripts) and is a Teaching Fellow at Southeastern Seminary in Wake Forest, NC. He has read scholarly papers at the National Evangelical Theological Society and is a columnist with the local newspaper. Abidan is also involved in an evangelistic outreach towards university students. Abidan lives in the community with his beautiful wife Nicole and their 4 kids (Rebecca – 22 yrs, Abigail – 18 yrs, Nicholas – 14 yrs, and Thomas – 11 yrs). Nicole’s father was also a pastor for about 30 years until he passed away due to cancer. She served on the mission field to Chile with her parents and family. God has always been faithful And Kind to us.. May your life be a living testimony to all. Spirit from you and a faithfulness to God as you stayed here. Thanks for allowing a humble. Servant as myself to to have been blessed by your presence. May God continue to bless you in your ministry until we gather at the feet of the Master one day in humble adoration. Hello Brother – Just a few minutes earlier, I was at an all time low – ice everywhere, my 2 little boys in the back seat, no town or community anywhere, and and too late to turn back. When you drove up to the gas station, at that moment, it was like God had sent an angel. Thank you for being so gracious and Christlike to us! I hope we are friends for life! God bless you in your ministry as well! Abidan, I watched your sermon about RG LeTourneau. I knew the man and Evelyn. Evelyn was the first person to challenge me to put my faith in Christ. I grew up in a family that knew the LeTourneaus and came to Longview, TX when RG opened his plant there. My parents moved from Peoria to Longview. My Dad worked for RG for 37 years. My older brother spent his whole career working either with LeTourneau or with a related sales and service business. We went to the same church, Pinewood Alliance Church. My best friend in my teen years was RG’s grandson, Gil. My Dad took our family to Liberia in ’56 for 2 years. I heard RG speak many times. He always opened by saying “I’m just a sinner saved by grace. I’m just a mechanic God has blessed.” My daughter and son heard me talk about RG many times. I want to send them the link to your message, especially my daughter as she is going through a tough time and needs to see beyond the immediate trial. I am the founder of a ministry called Watchman Fellowship. We are an apologetics ministry with a strong focus on counter-cult evangelism. Here is a link to our website – http://www.watchman.org. Oh wow! Thank you so much! It’s an honor to have you comment! I’ve read the watchman many many times and have learned a lot through them. Thank you for defending the faith and enabling us to do the same. RG Letourneau’s life has really impacted me, even though I never had the opportunity to meet him. His faith literally moved mountains! I became acquainted with his life through my dad who is an alliance pastor and I attended Toccoa Falls College. Again, thank you for your ministry! Greetings in the Name of our Lord and Savior, Jesus Christ. I was searching for images / slides with bits of Scripture from the book of Nehemiah, with an image or “word-picture” depicting the what is said, to help the person reading it imprint it on their heart, with the help of the Holy Spirit, of course. I post Scripture on my Facebook page, I try for every day, but illness has more frequently kept me from posting every day. I have two Facebook pages, The first one here is for Hand-on-Nursing, my Nursing Consulting and publishing page, the other is my personal page. Hi Elizabeth, Thank you so much for stopping by the blogsite! Nehemiah is one of my favorite books in the Bible! I’ve learned so much about falling God in spite of the circumstances. I love the way you described it as “honey to my heart.” I pray that God will use you to touch many lives as you’ve touched mine by just a comment!